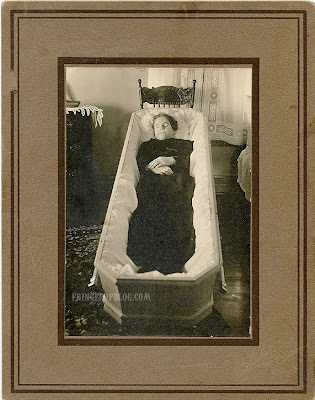 Haven't been buying hardly a thing in this bad economy, but couldn't resist purchasing this turn-of-the-century South Dakotan woman, post-mortem in coffin. I liked this piece because of the clarity of the photography (i.e. great contrast) and also because the full coffin is shown. As I've collected post-mortem photography, I've been most drawn to pieces that are very clearly post-mortem. It's less enjoyable to collect pieces when you have to "guess" whether the person was just photographed stiffly or whether the person is truly post-mortem. It was difficult, but I just resisted making a terribly corny joke right there. My understanding of these types of photographs - and I could be wrong, but my understanding is that many families photographed their dead, when photography was in its infancy, as a way to remember their loved ones. This was particularly true of children that died early. Photographs being incredibly expensive, the expense was saved for cases like this, rather than for fun times and family portraits. It is rare, though, to find a photograph of a person in a coffin, as photographers did try to make their subjects as lifelike as possible. That could be a bad memory remembering it wrong.. It is a great find for a collector. There may be a tidbit or two of interest, but as far as history goes, you've got it covered for sure. I was completely and totally obsessed with post-mortem photography a couple years ago. I spent a lot of time on thanatos.net and spent some time trying to find a not so expensive copy of Sleepy Beauty:Post Mortem Photography in America. I hear you about Sleeping Beauty. Those Burns books are so expensive and difficult to find. My fiancee and I became interested in pm photography a few years ago after seeing the horror movie "The Others." How did you become interested in the topic? I was helping my best friend research american pm for her senior thesis. I had two small children at the time and became fascinated with how many babies/toddlers were photographed. I later learned that it was common to photo those particular deaths because the baby had made it past infancy and were very dear to most families because of that. I had been on the fence about vaccinating my children before becoming interested in PM, after seeing all those deaths from illnesses children are now vaccinated against, it made up my mind. There's a Burns copy on Amazon for $300...I don't even spend $300 on all of my kids combined at Christmas time. I have thought about posting about PM for a long time...but never got the guts to do it. A lot of people don't understand the substance and interest behind it. Thank you for sharing. It's interesting to learn how others became interested, particularly since it is taboo. You're right that a lot of people don't understand the interest in the topic. I can understand their apprehension, since it can conjure up pain in regards to the death of loved ones in the past and in the future. It is an important part of our history, though, and I appreciate hearing your viewpoint.